Bagelman Sisters/Barry Sisters early photo with Claire Barry on the right. Yiddish music icons, Merna and Claire Barry, entertained generations of Jewish Americans with their jazzy versions of Yiddish songs. For over 40 years the Bagelman Sisters, later known as the Barry Sisters, were the darlings of Jewish entertainment. Their recordings could be found in almost every Jewish household in the 1950s and 60s. 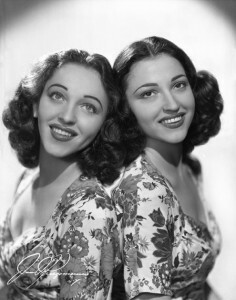 The younger of the two sisters, Merna, passed away in 1976. The older sister, Claire Barry, died on November 22, 2014 in Hollywood, FL at 94. Click here for full NY Times obituary. Who were the Barry Sisters? Two beautiful girls, dressed in the latest fashion, hair perfectly coiffed, singing with sultry voices that could make your heart leap. Born in New York, the two sisters were originally known as the Bagelman Sisters. Many saw them as the Yiddish answer to the popular Andrews Sisters in the 1940s. They combined old Jewish folk songs and Yiddish Theater ditties with swing arrangements and perfect harmony. When Clara and Minnie changed their names to Claire and Merna The Bagelman Sisters became The Barry Sisters. They have often been credited with creating Yiddish Swing, a music genre which did not exist previously. The glamorous Barry Sisters were regular guests at Yiddish radio programs like Yiddish Melodies in Swing. They toured with the Ed Sullivan Show to the Soviet Union and performed in Israel in October 1962. The popularity of their catchy and jazzy tunes may have paved the way for the Broadway hit, Fiddler on the Roof, and the klezmer revival of the late 70s. Listed below are some of their most popular tunes. The Judaica Sound Archives has 41 recordings by this dynamic duo of Yiddish music. Channah from Havannah (A Gala Concert with Moishe Oysher album, no. 3). Dem Neyem Sher (At Home With album, no. 2). Click here for more Barry Sisters recordings. Due to copyright concerns only snippets can be heard on our public website. Full versions are available to users of the RSA Research Station.